Thanks to your website, I was given some good info that allowed me to locate a rotting dead mouse in my attic. I was thrilled not to have to pay someone a bunch of money to do it! That detection enabled me, once I was in the attic, to pinpoint the carcass under a bunch of blown in insulation. It was disgusting. I was in a very difficult position while retrieving the dead mouse body. I noticed as I picked it up to bag it, that there were maggots under it, at least that's what I think they were, and a small stained spot under his body. They appeared to be scurrying to find darkness again, and I could not, from my position, make even a feeble attempt at killing them. I sprayed up in the attic with a household insecticide after disposing of the mouse. 1. Will the maggots (if that's what they were) die off now that they do not have a host? 2. Do you have a rough idea how long the smell will take to expire from the sheetrock ceiling in the affected room? 3. Do I need to fumigate, or decontaminate the attic now, and if so, what should I use? Thanks again, David. The info on your website is great. I'm also glad that now I have a decent access hatch to this other end of my attic, unaccesible from the garage hatch. This is one of the best notes I've ever gotten. Most of the emails I get are pointless with bad grammar. 1) The maggots will die if they are underdeveloped. If they are large enough, they will pupate and hatch into flies in 21 days. You probably won't notice anything either way. 2) The smell will fade with time. You shouldn't notice much more of the general odor any more, but if you stick your nose on that spot, you might smell it for another month. 3) You don't need to fumigate or decon your attic. I use Bac-Azap to clean biohazard waste, but you can either use a household cleaner and spray the juicy spot, or do nothing at all. If you do clean, don't use too much liquid, or you will get a water stain. I probably wouldn't do anything more. Thanks, David. I appreciate you e-mailing me back. 1. Inspect my home for entry points and close them up. 2. Go back through the attic spaces to inspect for any possible damage, and to clean them up. 3. 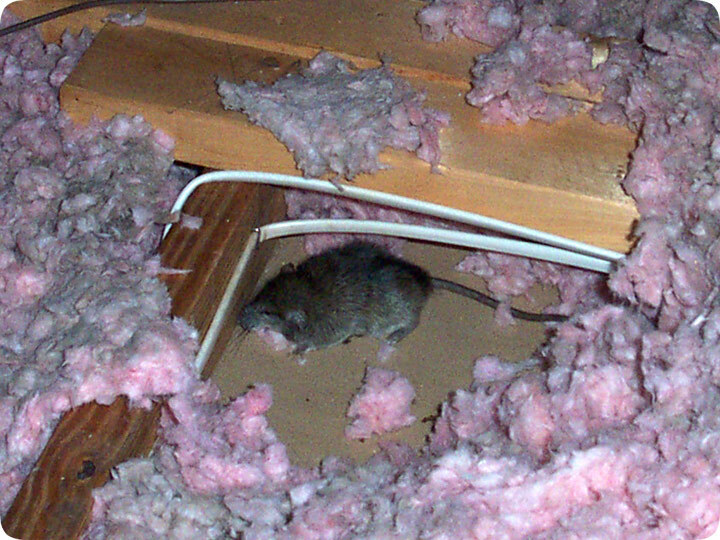 Set a few traps on each side of the house in the attic spaces. After this experience, I will never use a poison again. All the best to you and your family, David, during this holiday season! Blessings and peace.